This fiery kitten isn't available yet, but once it goes on sale it will be adoptable from the Pet Store for $10. Much like previous charity drives held by Blizzard, there will likely be a deadline for donations. More information and details on when and how to adopt the Cinder Kitten will be coming in the near future. Although the Cinder Kitten hasn't been released yet, there's still other ways you can help out the victims of Sandy. WarcraftPets is still accepting donations that will not only support the website but also aid many affected by the superstorm. For the remainder of this week, 50% of every donation will be added to our own donation of $250 to the American Red Cross. 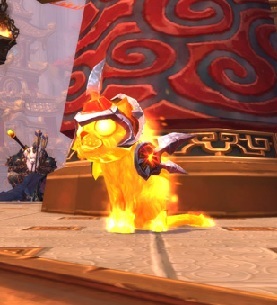 Whether you plan on purchasing a Cinder Kitten, or would like to donate to WarcraftPets, every little bit helps!